Keepsafe is a company behind privacy-focused iOS apps like Photo Vault, Blur for iMessages, Unlisted, and Secure VPN Proxy. Today the company expanded its suite of secure apps with the launch of "Keepsafe Browser," an app that enables users to browse the web privately [Direct Link]. The company says Keepsafe Browser ensures that all internet browsing history is kept private, and the app prevents third-party trackers from being able to target users. This means that users will be protected from ads, social networks, analytics, and content services built for targeting users online. Like other Keepsafe apps, users can lock access to the app using a unique entry code, which can also be tied into the iPhone's biometric security (Touch ID or Face ID) or Android Fingerprint. As long as you have the code set up and toggle on Touch ID/Face ID in settings, the request for Apple's security features will appear after you open the app in place of the code keypad entry field. Privacy controls include secret tabs that forget session data after they are closed, meaning that all cookies, caching, and URLs will be deleted. There are also normal tabs that store cookies and URLs locally so that users can quickly return to their favorite websites and remain logged in to their accounts on those sites. In the tab switcher screen, private tabs have a slightly blurred purple hue over them as well. 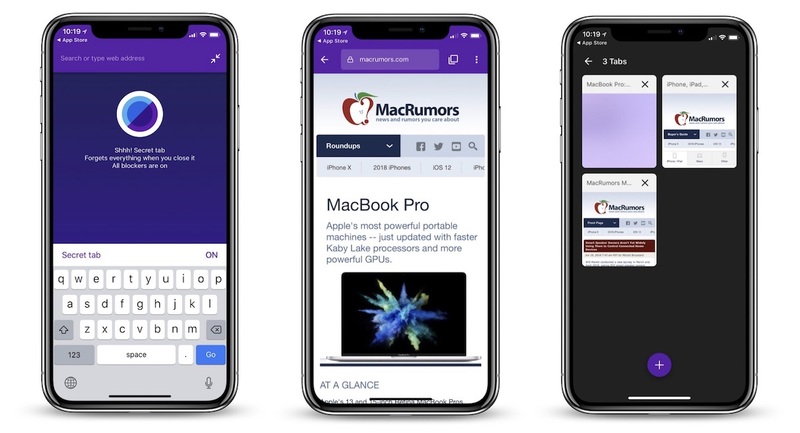 Many developers have updated or tested out private browsing modes in iOS apps recently, including YouTube's test of an "incognito mode" for its mobile app. Prior to that, Firefox updated its iOS app with default tracking protection in both regular and private browsing sessions, and last November Mozilla launched spin-off iOS app "Firefox Focus" built around secure web browsing. Apple has its own incognito mode alternative called Private Browsing in Safari, which prevents a user's browsing history from being saved, while also asking websites not to track users. At WWDC, the company detailed how privacy and security protections will be improved for users in iOS 12 and macOS Mojave, including support for automatic strong passwords. With this feature, Safari automatically creates, autofills, and stores passwords, and flags if they've been reused to make it easier for users to create unique passwords for each login. For Keepsafe, the company's new Keepsafe Browser app is available for free on iPhone and iPad [Direct Link].